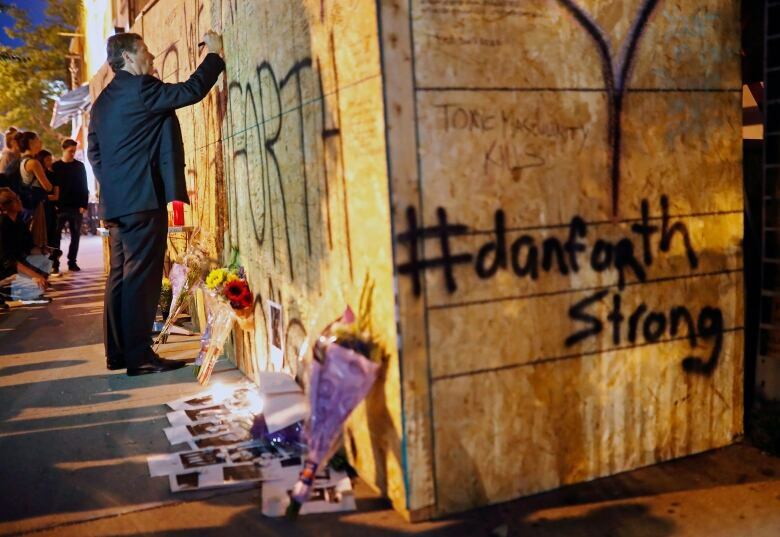 Residents of Toronto's Danforth Avenue gathered for a prayer service on Monday night to mourn the victims of a shooting the previous night that left two people dead and 13 wounded. The mood on the normally bustling street lined with restaurants, patios and boutiques was solemn after it was reopened by police. Candles, flowers and messages of support were left at various places along the street where gunshots were fired on Sunday night. Ontario NDP leader Andrea Horwath and Toronto Mayor John Tory joined members of the Greek Town neighbourhood at a local church for the prayer service just steps from where the shooting took place. "It was a church hall filled with love and many prayers were said for everybody," said Tory, who walked along Danforth to speak with pedestrians and people sitting on patios after leaving the church. "I felt that it was important to come out and not give in to fear," said Laila Hawrylyshyn, who attended both the prayer service and the walk down Danforth. "I was out earlier today and it was very eerie and I just decided that this is about community more than anything." 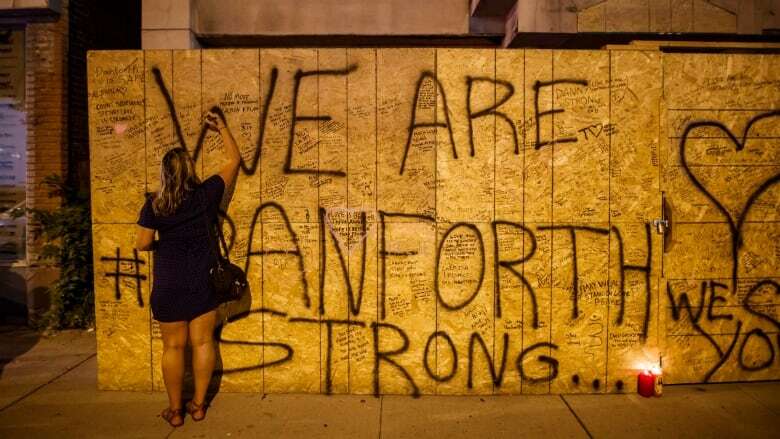 Residents have written messages of support, prayers and calls to end gun violence on construction hoarding that had "Danforth Strong" spray painted in large letters. A few steps away, people gathered at a fountain to leave flowers, notes and candles. Messages written in chalk around the fountain read "Greek town strong" and "We will not be afraid." At one restaurant where the shattered front windows were being replaced, a couple hugged each other and placed a bouquet of flowers next to stuffed animals and a pink balloon. Police had earlier identified 18-year-old Reese Fallon as the Toronto woman who died in the shooting. Jessica Harrison said she went to school with Fallon and that she attended the prayer service and vigil to remember her. She said she was "devastated" when she heard that Fallon had been fatally shot. "I think everybody is pretty shocked," said Harrison. Police said the family of the second victim, a 10-year-old girl, did not want her name released at this time. Investigators said six women and seven men ranging in age from 17 to 59 suffered injuries ranging from minor to serious in the shooting. Ontario's police watchdog identified the alleged shooter as 29-year-old Faisal Hussain, who died at the scene after a exchange of gunfire with police. Hussain's parents said Monday that they were devastated by their son's "senseless violence." They said in a statement that their son had struggled with psychosis and depression his entire life.